In these modern times our young people, who are poisoned in the schools with the venom of unbelief and apostasy, often begin to doubt the authenticity of the Gospel and demand proof that it is not simply a figment of man’s imagination, and sometimes even doubt whether the Lord Jesus Christ came to earth at all. But in response to all these doubts, the wonderful feast of the Image of our Lord Not-made-by-hands serves as vivid confirmation of our faith. 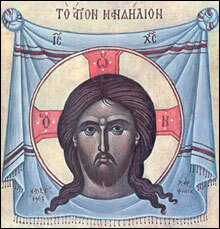 The Image of our Lord Not-made-by-hands appeared under the following circumstances: during Christ’s life on earth, there lived in the Syrian city of Edessa a certain Prince Augarus. He suffered from an incurable illness – leprosy, so that his entire body was covered with terrible sores, while internally he suffered from a complete paralysis of the body. Together with this missive Augarus at the same time sent a talented artist to the Palestine, commissioning him to paint the face of Christ on a wooden board. So great was Augarus’ love for Christ, which was inspired by his faith in Him, that he wished at least to see His image. After writing the letter, the Lord washed His face in water and dried it with a cloth, leaving a miraculous imprint of the Divine face on this cloth. Then the Lord sent this image to Augarus together with His letter. The Lord’s promise to Augarus was fully fulfilled after His ascension, when the Apostle Thaddeus came to Edessa and baptized Augarus, who came out of the baptismal font completely cleansed and renewed, both in body and soul. Let us, too, have this guileless and absolute faith in Christ which Augarus had; let us invite the Lord into our souls through the partaking of the Holy Mysteries; and may the Lord send us His grace and His mercy, cleanse us of the leprosy of iniquity and passion, and lead us into eternal life.